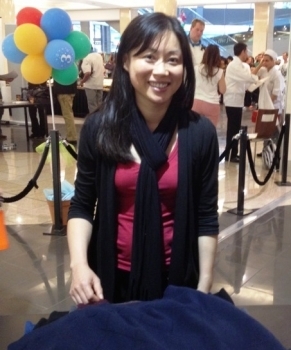 At Top Ryde City shopping centre, as part of their third birthday celebrations, separately Kim Sau and David Han participated in a record breaking challenge at Myer. The object of the exercise was to fold in a 'flick and fold' method, as many jumpers (sizing men's large), in thirty seconds. The independent witness ensured the jumpers were in a neat pile once the official clock was stopped. The two winners Kim Sau and David Han met with lots of quick handed competition, but remarkably both managed to fold a total of thirteen jumpers in record time.